A giant concrete-and-steel funnel has been placed over a blown-out oil well at the bottom of the Gulf of Mexico in a bid to contain oil leaking from it. The oil firm, BP, said it might take up to 12 hours for the containment device to settle in place, but that everything appeared to be going as planned. It is hoped it will be able to collect as much as 85% of the oil and begin funnelling it to ships above by Monday. Oil from a slick caused by the leak has washed ashore on islands off Louisiana. 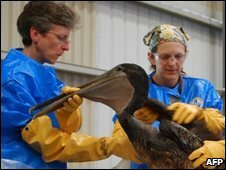 US officials announced on Friday they had closed Breton National Wildlife Refuge to the public after a silver sheen of oil reached the shoreline. The refuge includes the Chandeleur Islands chain. "The refuge closure is important to keep the public safe, to minimise disturbance to nesting colonial sea birds, and to allow personnel conducting cleanup operations and recovery efforts to work safely and efficiently," the US Fish and Wildlife Service said. The BBC's Rajesh Mirchandani on Dauphin Island, an inhabited barrier island three miles (5km) off the coast of Alabama, says there is a faint but distinct smell of oil in the air. Meanwhile, some scientists say the oil may be spread more widely. Small, black particles have been found in samples taken from below the surface, away from the visible slick, our correspondent adds. An estimated 5,000 barrels of oil a day has been leaking unstopped for 18 days from the well, 50 miles off Louisiana, since an explosion destroyed the Deepwater Horizon rig last month, killing 11 workers. Although the rig was operated by Transocean, it was leased by BP, which is responsible for cleaning the slick. The company hopes the 98-tonne containment device, once operational, will allow it to collect oil leaking out of the well while it attempts to stop the leak altogether by drilling relief wells nearby. 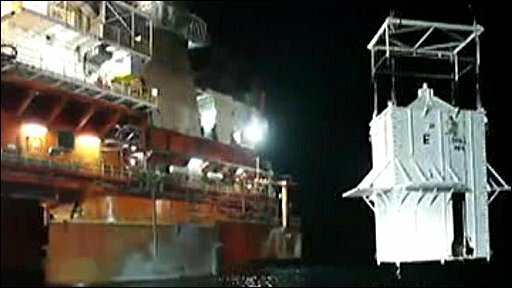 Earlier, remote-controlled submersibles guided the 40ft (12m) funnel above the wellhead, some 5,000ft below the surface. The technology has only ever been used a few times in shallow waters. "It appears to be going exactly as we hoped," BP spokesman Bill Salvin told the Associated Press. "Still lots of challenges ahead, but this is very good progress." Now that the containment device is on the seafloor, workers will need at least 12 hours to let it settle and make sure it is stable before the submersibles can hook up a pipe and hose that will funnel the oil up to a tanker. "We are essentially taking a four-storey building and lowering it 5,000ft and setting it on the head of a pin," Mr Salvin added. If the box works, another will be dropped onto a second, smaller leak. Experts warn that there is still a risk that any wrong move could damage the leaking pipe and make the problem worse. It is also possible for the pipe to the surface to become clogged with ice, and for the subsequent separation of the oil, gas and water to cause an explosion. In the meantime, residents of Louisiana, Mississippi, Alabama, and Florida await news of when the oil will reach their shores. BP said emergency teams had been sent to Freemason Island, a favourite fishing spot for recreational anglers some 30 miles off Louisiana's coast, to deploy inflatable booms to protect its prime marshland. Fears are growing that sea life may have been severely affected in the area, which includes vital spawning grounds for fish, shrimp and crabs. The attempt by BP to lower the funnel comes as Secretary of the Interior Ken Salazar called for a halt to permits for new exploratory drilling in the US, pending a 30-day investigation into the cause of the oil spill. Some environmentalists are now calling for a permanent ban on offshore drilling as a result of the spill.